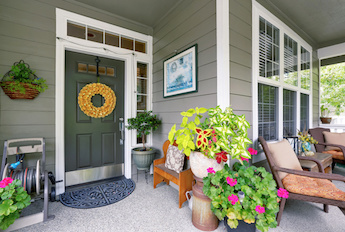 The front entry is key to your home’s curb appeal. Purchase a new door, or if you like the one you have but it needs a refresh, paint it. Create an eye-catching contrast by painting it a vibrant color. If new cabinets are out of your budget, give your kitchen a modern look easily and cost-effectively by changing out the fixtures. Update worn or dated kitchen drawer pulls and cabinet handles. It may seem daunting, but replacing faucets and toilets is a fairly straightforward task. A low-flush toilet may cost a bit more upfront, but you’ll save in long run with lower water consumption. Replacing old light fixtures will add value and freshness too. One of the simplest and most cost-effective improvements of all is paint. Freshly painted rooms always look updated and clean - and that means value. A functional, decorative ceiling fan provides light and creates a soft breeze in hot weather, reducing the need for expensive air conditioning. But, an outdated, wobbly or broken ceiling fan is an eyesore. Replacing old fixtures will add to your home’s look and your enjoyment. Fire pits, small fishponds and garden beds are refreshing features, and make spending time outdoors more enjoyable.